We have sketchy information on the last two weeks of Charles’ life. And at one point he insists he’s not doing drugs and wants to come home. But we have had multiple drug tests that say otherwise. We tell him he has rent paid up at the sober house and he needs to stay there first. All he has to do is three days in detox and then he can go back to the sober house. That’s the path to home. If he’s not doing drugs, it will be a piece of cake. And we are not entirely certain of his daily habit at this point. We know nothing. I know by now we can let him do drugs in his room and put us all at risk and drag us into the mayhem. Or let him be uncomfortable and hopefully force his hand to ask for help. So far nothing we have done has gotten him off this path of self destruction. We make it clear to Charles we will support recovery but not a habit. I can’t take more weird acting strangers in the house. I can’t have drugs delivered to my driveway anymore. I can’t have cooking at 2am with the stove burners left on and alarms going off from a smoke filled kitchen. He asks for money. We know what it will be spent on and hold our boundary hoping he’ll come around. He calls me next. He does not ask me for money. I feel utterly defeated and can’t understand the conversation. He doesn’t reveal much. I hear despair and I know his Dad thought he’d be able to pick him up over the weekend and get him help. He becomes so argumentative, I tell him I love him and I hang up. I wait because I know he’ll call back. He calls back and we try again for another hour. I don’t feel any closer to figuring out what’s going on. He goes from argumentative to manipulative and then childlike. And then after that emotional storm of a conversation, he asks a vague question about rehab and I gently try to nudge him in this direction. But I don’t think I say the right thing because I don’t know where he is, what’s going on. He gets angry when I mention heroin. He says he’s never touched the stuff and goes on a long rant. So one call that’s an hour. Another one that’s an hour. I am frustrated and emotionally tied in a knot. He starts screaming at me again. So I tell him I love him and I hang up. And I don’t pick up the next call. Traditionally when he was out of sorts about something, he’d call or text me incessantly, basically blowing up my phone. Usually, I’d have to let him cool off. So I silence my phone for a break to breathe and think while he calls over and over. I feel like bullets are coming at me. I just can’t sort it all out. Then I see a text come through from Charles. When I have looked back before at this last text, I always saw the isolated ones on 6/4 and I would wonder why I didn’t react like a normal mother to an obvious cry for help. This time, this week, I looked at the ones that came before to see it in context. Miles of rants, denial and manipulation– a hallmark of the illness of addiction and mental illness. The ones that came before reminded me how conversations often went. Of all the things I’ve written, this is the very hardest thing I have ever posted. It starts with his message about why he left the sober house. What’s on 6/4 is the text he sent after the phone conversation we had. The blue is mine. For many of you, it’s so obvious. To me after, it was so obvious. And I sound so dismissive when in fact, I’m just at a loss at what to say. I am also scared, overwhelmed and decision impaired. I realize now just how hard it is to go from tough love to rescue mode in an instant. 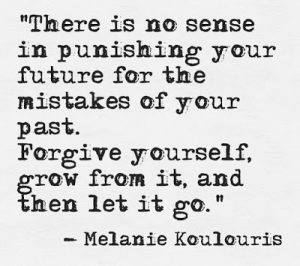 To move forward, I must forgive myself–to remember that message in the context of all the crazy manipulation and mayhem known as mental illness and addiction. I have to remember that he always adamantly denied suffering from depression and I did not know he was in a deep depressive state. I didn’t know he was in withdrawal. I had no clue he was suicidal, that he was alone or much of anything else. I have to stop torturing myself for hesitating to choose door A when I should have chosen door B in an instant. Because I had no idea that hesitation would cost me the life of my child. That he would hang himself that night. I’m thinking I have time to call, ask advice and weigh options. I did not. I did call a support group member but that we didn’t dole out advice to each other. 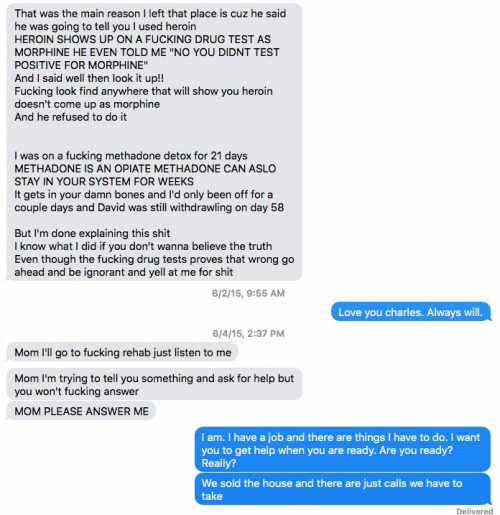 I also know if I had saved him that day, Charles was not going to make it through something as harsh as an opiate addiction. He was simply too fragile. He had relapsed within hours of rehab. He never had a lot of inner resources when it came to helping himself. An opiate addiction is the most difficult kind of addiction, with multiple relapses and 7+ rehabs or more. He would not have accepted treatment for his depression, making sobriety that much more unobtainable. That you can hear in his song, I Don’t Want to Be a Patient. I have to accept that 20 years of Charles was a gift. That this has to be enough. That he was not “mine” in the first place. That I had to give him back earlier than I wanted. And I have to know that I will use this as a turning point in my own life to do something that will inspire positive change. Very powerful. You did everything possible a loving mother could possibly do. It is impossible to stop a moving freight train that is on a trajectory to go in a certain direction no matter how hard you try to stop it. The frieght train was the addiction, the mental illness… And your son and mine were on for the ride and would not come off. I know you are right. I work at this every day. Sigh. Thank you for telling your story here Tjwanna. I can’t believe how heartbreaking that is. And so honored you shared it here first. I know it was hard. But you are right. Someone that is determined will do what they do and we can’t control that. Thank you, Anne, for sharing these raw and torturous moments in your life with us. I am so sorry for your loss and pain. Please KNOW, that regardless of what You did or did not do that night, the choice was his, NOT yours to make, so please let go of the ‘unknown’ as you could not make the choice for him. It is very clear that you would have chosen to ‘save’ him, but HE was ill and made a choice in that moment – it is not because you did or did not do something Anne. Anyone who reads your post, can tell that, of course, you would have rescued him, held him one more time, sung, danced and breathed life into him one more time, if you could have. Your mother’s broken-heart is very clear here. Most cannot even imagine what you have been through and most certainly pray that they never have to experience it. You are so very brave to pour out your heart to us here. You shared to help others and yourself. Forgiveness is about healing you and helping you, first and then other. Forgiving ourselves is often much more difficult than forgiving others who have hurt us. We tend to hold ourselves at a different standard and expect more. Yet, even doing ALL that you knew to do – right – you could not ‘save’ him – and it was not your job to save him. It was your job to LOVE him…and that you did and did very well! As you continue your journey of forgiving yourself, you will help others and sharing as you have, so raw and real, is what so many need to see and hear. Again, I am so sorry for your loss and your heart-ache. I wish you continued healing and hope through the only ONE who can give it (God our Father, through Christ Jesus). I pray that you soon feel some relief from the grief, as you continue on this journey to help others and bring hope to a world that needs to hear your message. Thank you for sharing so bravely and honestly, Anne. You have survived so much, more than any parent should have to bear. Unimaginable loss. Unimaginable self-torturing feelings of guilt. Your strength and generosity of spirit are beyond description. Together, you and Charles will change lives, giving meaning and purpose to his life and death. Keep surviving, and teaching. Somehow, with your gifts, it seems that you and he were always meant to fight for this cause, speaking for parents and children who can’t. I truly believe in God and a Heaven. I also believe that Charles is finally at peace and stronger than ever, watching you and by your side. Thank you for sharing your journey thriugh the endless struggles of addiction vs love for your child! I am a daughter of a recovering addict now 10years! I have answered many phone calls that you endured from your beloved son Charles, spent many nights in fear that she would not make it through another day in her disease of depression and addiction. I’m so thankful to say that she did! It was after finding herself and forgiving herself while incarcerated for 9 months! I also had to find forgiveness within myself for the phone calls that I didn’t answer out of complete exhaustion and anger! I continue to struggle with this. So I thank you again for your encouragement and devotion to the memory of your son! May God continue to give you strength and a voice for others! Anne Moss, Your text messages back to Charles show love, support and patience – a lot of all of them. Charles was going to do what he was going to do and deny what was reality to himself and others. Yes, he was unstable. Addiction is a slow form of suicide. He was in a hurry after his addictions didn’t prevent enough pain. Charles chose to hide from his own truth and to hide his true emotions and upsets from his family. You truly were and are a great parent. You also don’t mention your own brain cancer and all the trouble and heartache that it’s caused you over the years. You’ve been selfless, strong and loving. Your blog is a reflection on all of the positive things that you brought to Charles from the first day of his life. Your blog is a reflection on all the strong and positive things that you’re doing to help others who find themselves on the same difficult path with their loved ones. You don’t need to forgive yourself of anything – you never have needed to do this. All of us can be so incredibly tough and judgemental when it comes to ourselves. I’m my own worst critic. I believe the same is true of you. My hope is that by writing and sharing these specific thoughts, you gain true perspective on yourself as a real life loving and supportive parent. My hope is that this, and everything you’re doing today, helps you to regain a major portion of your beautiful life. You deserve it. A-M, in a way that no one would ever choose, you have gone through a personal hell most can never imagine. That in itself is a test of sanity. But your willingness to share your family’s experiences–through your strength and fueled by Charles’ lifelong gift of conveying his own personal demons through words and music, is giving so many others a a depth of understanding that is profound, raw, heartbreaking AND life changing. Thank you. Thank you for sharing Anne. I wish you continued strength through your journey.